Thank you Assemblywoman Aileen Gunther who introduced K367, memorializing the Congress of the United States to encourage the effort to create an Office of the National Nurse, into the New York State Assembly on March 26, 2007. The bill amassed 50 sponsors before it was sent to the floor of the Assembly and adopted unanimously by all voting members. The New York Assembly unanimously adopted a resolution Wednesday encouraging the Congress of the United States to create an Office of the National Nurse. New York Assemblywoman and nurse Aileen Gunther (District 98) brought Oregon nurse Teri Mills’ vision to create the office a big step forward with Resolution K367. "Nurses work to keep patients healthy through preventive, proactive care," Gunther said. "A National Nurse would serve as a valuable counterpart to the U.S. Surgeon General to help raise awareness of preventive health issues while providing community outreach. In addition, there is currently a shortage of nurses in the U.S. and a National Nurse would inspire more young Americans to enter the nursing profession." Efforts to create an Office of the National Nurse began on May 20, 2005, the day the New York Times published America’s Nurse, authored by Mills. The intent of the Office of the National Nurse is to focus Americans on health rather than sickness. Working with state-level coordinators and teams of nurse volunteers from around the nation, a recognized and trusted National Nurse will regularly deliver messages about key health issues to the public and serve as an effective complement to the Office of the Surgeon General. Thus far, the campaign has led to the introduction in 2006 of a National Nurse bill in the House of Representatives by Rep. Lois Capps (CA-23), and a great deal of interest among elected legislators. At the close of the 2006 legislative session, the bill had bipartisan support with 42 members of Congress signing on as cosponsors, a remarkable achievement for legislation introduced for the first time. The Office of the National Nurse would improve the nation’s health through education designed to reduce risks posed by preventable conditions such as poor diet and sedentary lifestyle. RESOLVED, That copies of this Resolution, suitably engrossed, be transmitted to the President of the Senate of the United States, the Speaker of the House of Representatives, and to each member of the Congress of the United States from the State of New York. Update: On Wednesday, April 25, 2007, Barbara Ficarra, RN, BSN, MPA, Host/Producer of Health in 30™ and Nurses in Motion™ with Scribe Media has invited Keith Olsen, BA, RN and Edie Brous, JD, RN to be guests on the show, Nurses in Motion™, to talk about the proposal to create an Office of the National Nurse. A videostream of the program will be made available after filming, and as soon as it is, the National Nursing Network Organization will make the link available on this website. Thanks to the generosity of supporters, seven members of the National Nurse Team were able to return to Capitol Hill the end of last month. Packets including donor certificates were delivered to 39 Congressional offices. Meetings were held with the staff of 14 members of the House of Representatives. It was also an honor to meet with RADM Chief Nurse Officer of the USPHS Carol Romano, Chief of Staff to the Surgeon General Robert Williams, Chair of the Nursing Professional Advisory Committee of the USPHS CAPT David Kelly, and Fellow to the Office of the Surgeon General Mary Beth Bigley. Team members were encouraged and heard time and time again that creating an Office of the National Nurse to complement the efforts of the Surgeon General and assist with the delivery of the prevention message was a good idea, that we are on the right track, and that that we should proceed forward. 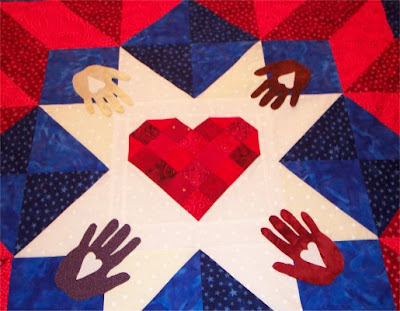 Thank you to National Nurse supporter and Portland Community Faculty member Doris Werkman for designing and contributing this beautiful quilt to be given to the country's first National Nurse. The design of a diverse group of helping hands placed on red, white, and blue material symbolizes what many are trying to accomplish, the delivery of the prevention message to promote healthier living for every American. The quilt is beautiful!! I hope whoever receives it recognizes the effort and wishes put into it. Nurses are generally regarded as being kind and compassionate. What is not generally recognized is their medical expertise and the vital and often primary role a nurse plays in providing quality health care. Yet it is this combination of compassion, understanding and medical expertise that makes nurses a perfect choice as advocates and educators in health care. On the front lines of health care, a nurse is often the health professional responsible for providing continuous 24 hour care to those in need. Nurses not only care for patient’s physical needs but they treat their emotional needs as well. Working together with other health care professionals, the nurse is there to educate the patient regarding their continuing health care and preventive measures. However, our current system of health care is often reactive rather than pro-active. As experienced health care professionals, nurses are a perfect choice to lead the change in American health care by educating the public regarding proper health care and the prevention of illnesses. As educated professionals, our knowledge and expertise should afford nurses the opportunity to inform the American public of vital health issues. It is imperative that nurses stand among the leaders in our nation's health care system, yet it is crucial that nurses work in collaboration with physicians and other medical professionals in providing quality health care to the American public. Together we are strong with the respective strengths of physicians and nurses combining to care for the good of all patients “Healthcare Professionals Together for You. "™ So alongside the Surgeon General will stand a National Nurse, helping to lead the evolution of the nation's health care system in the 21st century into one of education and prevention. Nurses need to recognize that they are health experts and communicators. Health in 30™ a weekly live radio show is dedicated to the responsible sharing of health information with leading medical experts and it provides listeners with the latest medical news and information; it is educational, informative and entertaining. The philosophy of Health in 30™ is simple and two-fold. First, the primary goal is to educate the public about vital health topics, to encourage the public to take charge of their health and speak up on certain issues; and second it is to have all health care professionals, especially nurses “Speak Out” to encourage them to become the experts that they truly are. They have the opportunity to become involved in the media as experts, either as a guest on the radio show and/or as a writer for the website. Nurses need to be recognized as the true professionals they are. Nurses must step forward and advocate for the public. Health in 30 ™is on-air and online. Health in 30™ airs live every Friday from 5:30 p.m. to 6:00 p.m. EST and it is broadcasted on WRCR AM 1300 Radio Rockland. Streaming live at Healthin30.com, click the WRCR logo to listen live, Health in 30 is there to provide listeners with health information with leading guest medical/health experts. Healthin30.com is the extension of the radio show. On Healthin30.com readers can get more in-depth information from the experts, listen to audio, sign-up for free newsletters, plus a lot more! To address this issue of the National Nurse, Barbara Ficarra, creator, producer and host of Nurses in Motion™ with Scribe Media will discuss the topic of National Nurse for WebTV; guests include: Keith Olsen, RN advocate to create an Office of the National Nurse and Edith Brous, RN, JD. Details to follow at Healthin30.com. Barbara Ficarra, RN, BSN, MPA is an award-winning journalist and the creator/producer/host of Health in 30™ radio show which airs live every Friday from 5:30 p.m. to 6:00 p.m. EST, broadcasts on WRCR-AM 1300 and streams live online at Healthin30.com – click the WRCR logo to listen live! Health in 30™ is a 30-minute show that brings listeners the latest health and medical news and information with leading guest medical experts. Barbara conducts lively and informative discussions with leaders in their fields to provide vital health information on a broad range of topics, while focusing on education and prevention; and listeners will often call-in with questions. 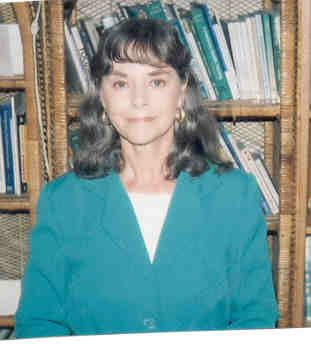 Barbara is also the creator and editor-in-chief of the Healthin30.com website. Healthin30.com is dedicated to the responsible sharing of information from leaders in the healthcare industry. On Healthin30.com, readers can get more in-depth information and tips from these same experts. The highlight of the website is the “Speak Out” logo, this is where all medical communicators can go to sign-up to be a guest on the Health in 30™ show and/or write for the website. Nurses are especially encouraged to sign-up and to use their voice to advocate to the pubic that they are medical experts and communicators. Barbara has teamed up with Scribe Media and Health in 30™ has expanded from radio to broadband media outlets; Barbara is the creator/host/producer of Health in 30™ for Scribe Media, additionally she is the creator/host/producer of Nurses in Motion™ for Scribe Media; a continuing series on issues surrounding the nursing profession. Barbara is a media consultant, health communicator and co-coach with Media Image Coach and she is also working with Televersemedia Productions producing health documentaries. Barbara has been selected by the American College of Emergency Physicians (ACEP) to receive a prestigious Journalism Award of Excellence for Coverage of Emergency Medicine. The program, “Ins and Outs of the ER” covered what to expect in the ER and the challenges of crowding and waiting. “Awards are given for outstanding coverage of an emergency medicine issue, in-depth analysis or investigation that brings clarity to a key emergency medicine issue and educates the public and significant impact that motivates positive change or breaks a new story that generates widespread coverage.” Barbara will be honored by ACEP at the Leadership and Advocacy Conference on May 1st at the Hyatt Regency on Capitol Hill in Washington, D.C.
Barbara was selected to teach at the American Medical Association’s Medical Communications Conference in Tampa, Florida on April 12th. 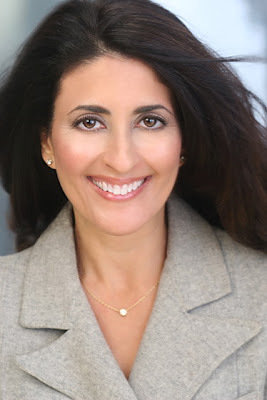 On April 20th Barbara will be the keynote speaker at the American Association of Critical Care Nurses in Fairfield, NJ, April 21st she will be speaking at the Hudson Valley Chapter of the American Society of Ophthalmic Registered Nurses in Mt. Kisco NY, and Barbara will be the closing keynote speaker on April 27th at the Nursing Spectrum Career Fair in Teaneck, NJ. Barbara will also be the Keynote Speaker at two Nursing Spectrum Career Fairs in October. Barbara is a member of the National Association of Medical Communicators and New York Women in Communications. Barbara has media training featuring teleprompter, anchoring, hosting, broadcasting and interviewing; and she is a published author. "Nurses have so much to offer and we need to show consumers our holistic and health promotion roots, and how they're different from a medical approach. The Office of the National Nurse is an excellent way to provide this information and put forth a role model who can be an articulate spokesperson for the profession." The National Nurse Campaign is a grassroots effort, which means funding received is from supporters like you. 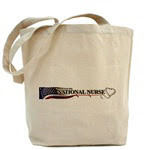 To keep the efforts going strong, please visit the National Nurse Cafe Press website and make a purchase. 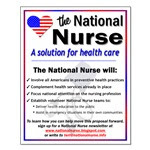 Mugs, bumperstickers, buttons, teeshirts, magnets and other merchandise that are featured will help get the word out about the ongoing efforts to create an Office of the National Nurse and they would also make a great gift to celebrate Nurses Week. The poster above can also be found at the National Nurse Cafe Press website or you can email teri@nationalnurse.info for a FREE smaller version. The Board of Directors of the National Nursing Network Organization voted unanimously to adopt the following Donor Bill of Rights. The premise of this bill is that philanthropy is based on volunteer action for the common good. Further, the bill states that it is a tradition of giving and sharing that is primary to the quality of life. 1. The right to be informed of the organizational mission, of the way the organization intends to use donated resources, and of its capacity to use these donations effectively for their intended purposes. 2. To know the identity of those serving on the National Nursing Network Organization Board of Directors. 3. Be able to access the organization's most recent financial statements (email teri@nationalnurse.info for this information). 4. Be assured that your gifts will only be used for the purposes given. 5. Receive appropriate acknowledgement and recognition. 6. Know that information about your donations will be handled with respect and confidentiality to the extent provided by law. 7. Expect that any relationship with an individual representing organizations of interest to the donor will be professional in nature. 8. Know that any solicitation for a donation is coming directly from a volunteer. 9. Be able to remove their name from the mailing list at any time. 10. Ask questions and receive prompt and truthful answers.